One of the largest and most popular amusement parks in the Los Angeles area, the park offers rides, shows, tours, roller coasters, other various attractions, and a downtown Universal, called CityWalk, which is much like Downtown Disney, with its very own unique shops and outstanding dining areas. Universal Studios Hollywood is a home studio to some of the most famous blockbuster movies and shooting sets of all time, with favorites such as Back To The Future, Jaws, and Jurassic Park, to just name a few. Tours are designed to allow park guests to be guided through the sets of various movies while being immersed in the excitement of rides, attractions, and special effects. You will never look at the big screen in quite the same way, after seeing the special effects, tricks, sets, stunts, actors, and secrets behind so many of your favorite films. It’s helpful to note that the park is split into two very large and distinct levels, all connected by huge escalators referred to as the Starway. The Upper Lot is the location of many family-friendly attractions and a large number of the shows including the Special Effects Stage, and Shrek 4-D, along with shopping, dining and more. The Lower Lot hosts Jurassic Park: The Ride, Transformers: The Ride and many other favorites. Throughout the park as you walk, shop, or dine you will encounter famous characters and Hollywood icons who roam the grounds to entertain and inspire guests. Betty Boop, Curious George, Doc from Back to the Future, and Transformers are a very small sampling of what you will likely see on your visit. The real beauty of this particular theme park is that there is something for every preference and all of the offerings incorporate special effects and technology you would expect from anything with the Universal Studios logo. We thoroughly enjoyed the genius of King Kong 360 3-D created by legendary and award-winning Peter Jackson. 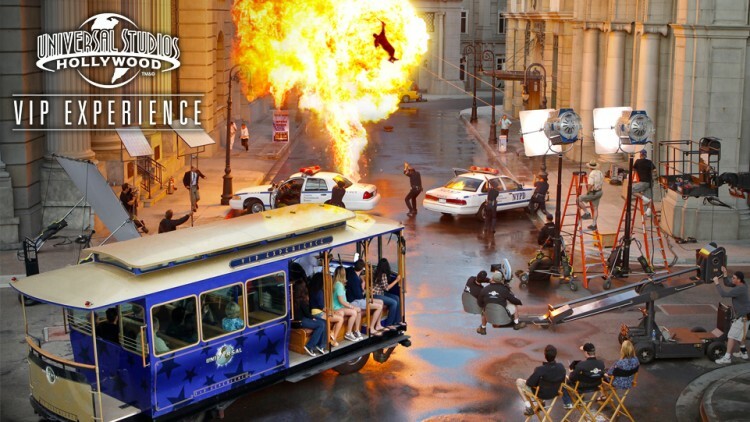 It’s the world’s largest 3-D experience, and is part of the amazing Universal Studios Hollywood Studio Tour where you will take a shuttle bus through many of the sets and backdrops of prior Universal movies. You will see Western towns, a flash flooded desert, the clock tower from Back to the Future, and famous homes from some of your favorite sitcoms. You will experience earthquakes, fires, plane crashes, and other horific disasters. This Studio Tour is the lifeblood of Universal Studios. You should plan to do this must-see attraction early in the day before the lines get too long. Be ready to take lots of photos and to be impressed. Another favorite for any animal and film lover is the Animal Actors show which encompasses an enthralling and elaborate animal show where audiences have live interaction with famous furry movie stars from such movies as Beverly Hills Chihuahua and Hotel for Dogs. We saw dogs, cats, pigs, exotic birds and many other famous and perfectly trained animal actors perform spectacular acts and tricks. At the end of the show were wonderful photo opportunities for everyone in the audience and the entire experience was truly unforgettable. Our favorites included Water World where guests can watch an adventurous and acrobatic live show with many famous actors partaking in a water based story of good against evil. This #1 rated show at Universal Studios Hollywood includes jet-skiers, acrobatic plunges, explosions, brawls, fireworks, fire fights, and a fiery hot plane crash. This is all executed beautifully and flawlessly on a new set with an all new cast and new action and stunts so you won’t want to miss any moment of all the excitement. Aside from all the spectacular attractions and shows the park also has a number of exclusive dining areas, both in the CityWalk, and within the very park itself. We loved the gargantuan donuts sold within the park. They literally, are the size of a Frisbee and will feed both of you. They are a spectacle to see and taste. We also enjoyed a lunch at Panda Express. The options are varied and conveniently located throughout the park. Universal Hollywood offers many more photo opportunities than many other large theme parks. Characters are often willing to oblige for a pose and many of the shows offer fantastic vantage points for photos. The park is large and does draw a large number of visitors, particularly on the weekends and during holidays. Lines can be very long so plan to spend the entire day from opening to closing if you truly plan to enjoy all the attractions. A mid week visit can be a good way to see the entire park at an unhurried pace. Even with an extremely recommended and valuable Front of the Line or VIP admission, you will need to plan your route throughout the park and utilize the entire day if you want to maximize your visit and experience all the fun. Parking is a bit pricey so plan ahead or you may consider taking advantage of the free shuttle from the nearby bus station. Universal Studios Hollywood is an absolute must for any visit to Southern California. You and your travel partner will never look at movies quite the same way again.